This interview is reprinted from buildingSMART UKI Bulletin December 2014. Related article: What’s going on with BIM in Russia. Autodesk University Russia was a two-day event held in Moscow on 1–2 October 2014, spreading good practice and raising awareness. As at other Autodesk University events, participants had the chance to hear about how information modelling is used in sectors such as engineering, industrial product development, infrastructure, GIS – and of course construction. Nick Nisbet (top right), bS UKI’s technical co-ordinator, and Marina Korol (bottom right), from consultancy Concurator and Intelligent Construction, a Russian non-profit organisation, were both present. This interview with bulletin editor Betzy Dinesen gives insider and outsider perspectives on the progress of BIM in Russia. Betzy Dinesen: Marina, as an insider, would you say that attitudes towards BIM have changed over the last five years? Marina Korol: Five years in this field is ages! We have witnessed dramatic changes in attitudes, especially during the last year. Today, discussions are no longer about whether BIM can give any value to companies in AEC industry but on how to make the transition less painful, how to choose the right pace and change the mindset of staff. And the most promising trend of the last year is the raised level of awareness of BIM benefits among construction clients. BD: And Nick, coming to Russia as an outsider, how does the approach to BIM compare with what we are doing in the UK and in other countries where you have worked? Nick Nisbet: For my part, I found that many people were still asking questions about the immediate return on investment – a question which the UK floundered on for several years. But there was also a good awareness that BIM was a strategic direction for the construction sector, with lots of interest in improving the overall outcomes. BD: Marina, what types of projects in Russia are using BIM? MK: There are dozens of known projects where BIM has been implemented at the design phase. But what really should be mentioned are the projects of the state corporation, ROSATOM, where BIM is integrated in the processes at all stages of the life-cycle. Their design company, NIAEP, are using cutting-edge technologies for designing nuclear power plants. KB ViPS from St Petersburg are advanced BIM users and among their most interesting projects is the New Mariinsky Theatre. Private design–build (or design, build, operate and maintain) companies – working mainly in housing and commercial real estate – also demonstrate the successful adoption of BIM at the design phase, for construction management and for doing first steps for operational phase. Among them is the Etalon Group, also from St Petersburg, with multiple BIM projects both there and in Moscow. And international companies are leveraging their global experience on projects in Russia, such as AECOM which has completed the Spartak Stadium in Moscow. BD: Nick, did you give a presentation at Autodesk University Russia? NN: In fact, I gave two presentations. One was an open session on the topic of ‘UK BIM Today’, discussing the role of government as a client in pulling the industry forward. The second was a session by invitation on ‘UK BIM Tomorrow’ where I explored the UK joint government and industry construction strategy for 2025. BD: Marina, do Russian architects and building professionals have the right technical skills to start using BIM? MK: In terms of BIM software usage we are on the right track with AEC design consultants. People are learning. There are many companies providing training services. We’re witnessing growing interest in BIM software adoption. Building contractors are still lagging behind, however. But apart from the pure technical software skills, it is the organisational aspects – new processes, new collaborative practices – that we have to tackle. Here we must make a serious move forward, and this is certainly more difficult. BD: Nick, when you meet building professionals in Russia, what software needs have you identified? NN: At the Autodesk University Russia event, Autodesk products featured strongly, of course. But there was also a strong interest in the role that checking applications may have in accelerating processes and improving the product. Russia has a strong history in structural and mechanical engineering, and many people asked about how that expertise can be captured. There was also a lot of interest in better methods of cost control, where the UK is demonstrating strong products and skills. 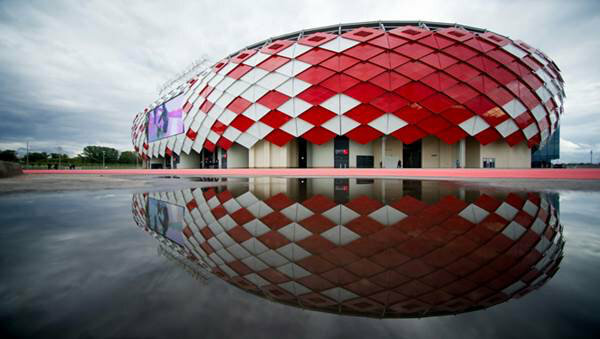 Spartak Stadium designed by AECOM – the football stadium is home to Spartak Moscow (known as the ‘red and whites’) and echoes the team colours. BD: Marina, is the Russian government taking steps to encourage the uptake of BIM? MK: First, I should say that innovation features very high on the government agenda. One example is the innovation cluster at Skolkovo, near Moscow, which has five priority directions. The goal here is to provide support to innovative business and help in the commercialisation of innovations, with residents benefiting from a very favourable tax regime. Even today, before the town is fully built, hundreds of innovative start-ups are registered as Skolkovo residents. Elsewhere, there are mandatory innovation programmes for state-owned corporations, such as Gazprom and Russian Railways. There is a special Presidential Council for the modernisation and innovative development of the Russian economy, with regular meetings devoted to discussion of innovative ways of developing our various industries. One meeting in March was dedicated to innovation in construction. Among the key decisions was an agreement to develop an innovation strategy for the construction industry as well as a phased plan for BIM implementation in the Russian Federation. These decisions have been published as government orders and the work is under way. At Intelligent Construction, we are deeply involved in the work, alongside the International Academy of Architecture (IAAM, Moscow branch), the Russian Ministry of Construction and the National Association of Design Engineers. BD: Nick, when you talked to your audience about our own plans for levels 3 and 4, did they see relevance in it for them? NN: It was exciting to explore the strategic potential for BIM and sharing structured information in general. Both in the UK and Russia, the key question is still how to get to a more integrated industry. At the beginning of the year, the UK and Russian economies were pretty much the same size. Simple messages such as seven schools for the price of five illustrate that BIM does offer growth and social benefit. BD: Marina, as you see it, what steps does Russia need to take to accelerate the uptake of BIM? MK: First, we still need greater awareness of the benefits that BIM might give to public client. On our way to BIM, we missed the stage when the business case for BIM is developed. Secondly, we badly need standards to support BIM-wide adoption across the country. 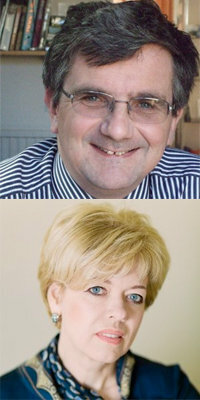 BD: Nick, you have experience in various countries of seeing BIM being nurtured? What advice would you give to Russian colleagues? NN: The key advice is to start, and they have done that. The basic ideas – such as efficiency, checking and integration – are universal. What will be specific to Russia is the way the professions, commerce and government support each other. The government is committing itself, and so the professional and commercial sector must come forward with lively case studies to make BIM incontrovertible. BD: Marina, Nick, any closing thoughts? NN: I was asked about small firms while I was in Moscow, so I mentioned that this last summer, when I discussing with a landscape gardener the job of replanning my small garden (which is only 120 sqm), he offered me a buildingSMART IFC file of his proposals. Small job, big vision!